So here we are, week 5 of the One room Challenge. 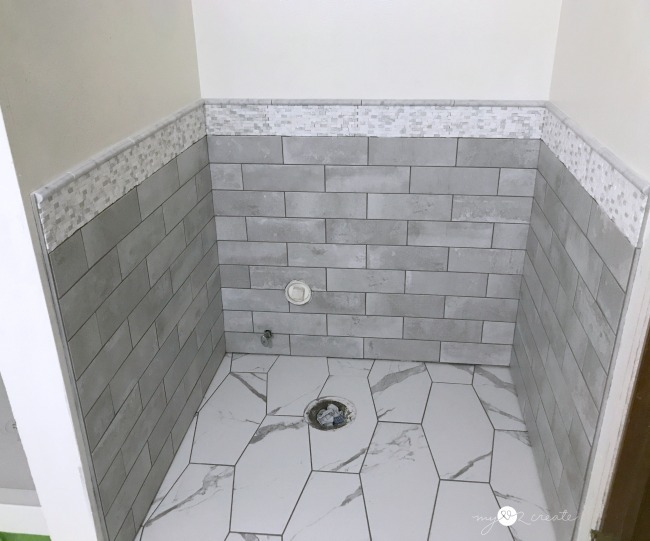 I am going to show you my Bathroom/Laundry Room Progress...and then we all need to pray...for reals. And I am not even kidding. Now is the time for those miracles! 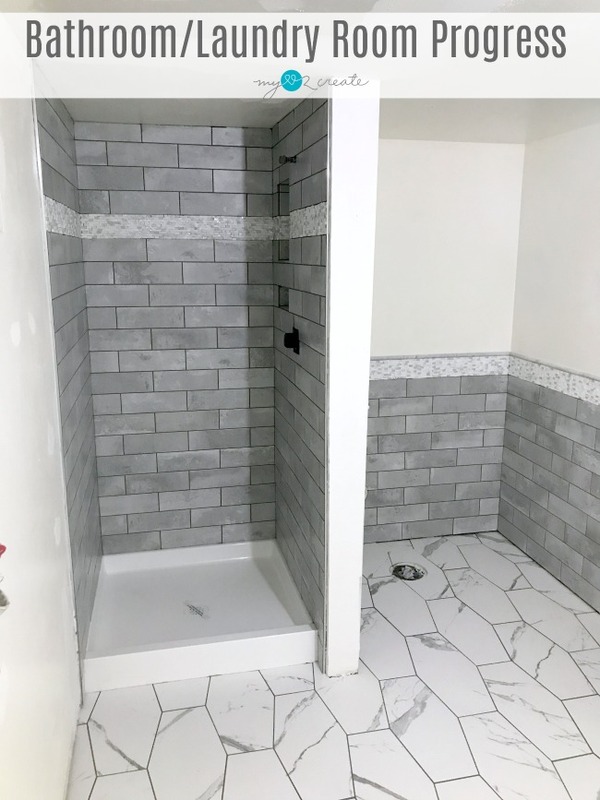 The reality of just getting this far is pretty amazing...that is a TON of beautiful tile!! And I have more! 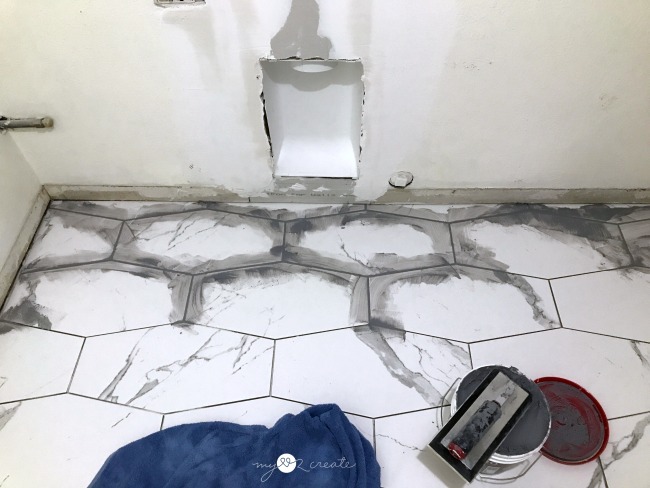 Yes...more tiling to do, but you will just have to wait for the reveal because I didn't have a chance to get to it this week. Instead, I solved the problem of getting the dryer vent into the wall. 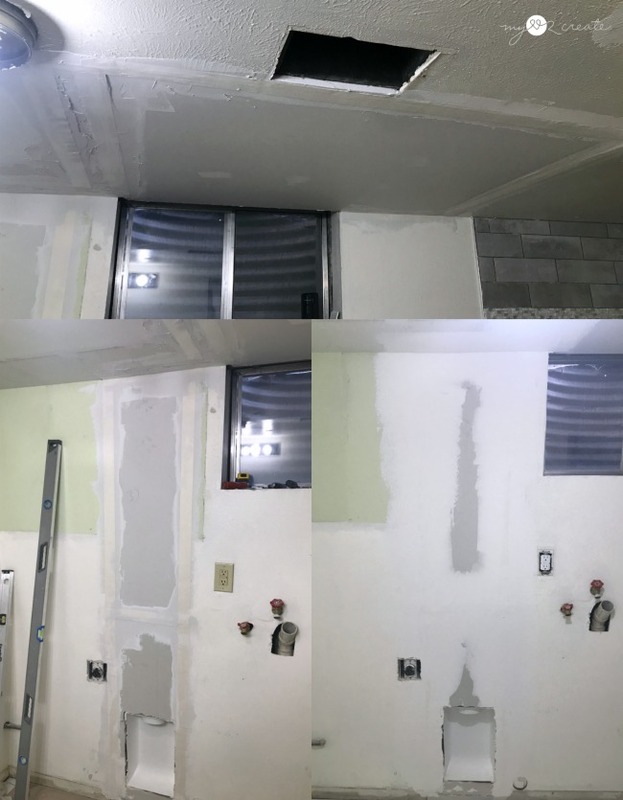 My friends husband was a great help with installation. 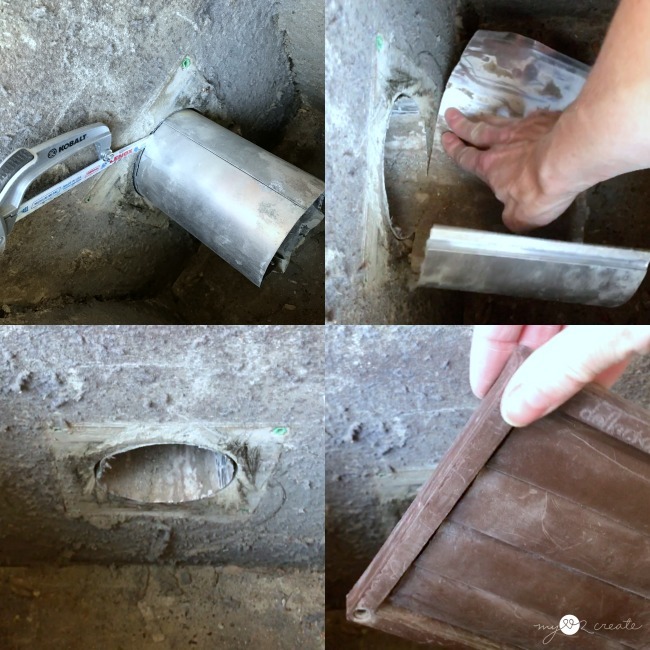 I used a Recessed Dryer Vent Box , which will be super nice to have. Working full time and taking care of my kids and going to all their end of the year events takes most of my days, so help from friends has saved me a ton of time rather than me doing everything by myself, which is what I usually do. The duct work that goes from the inside to the outside needed to be trimmed down. That is how much it was sticking out of the wall into the bathroom! I am sooo glad it will be hidden now! Next up was drywalling! Woo hoo. 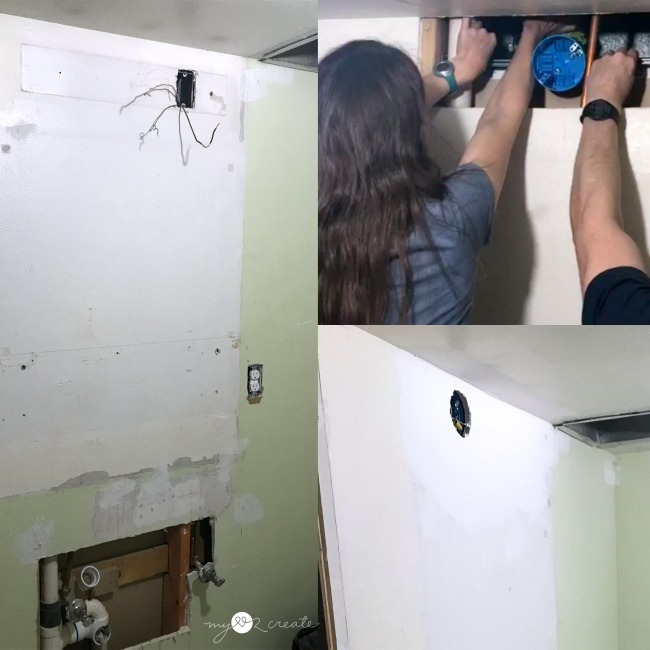 I know how to drywall, I had to learn when I did my Teen Boys Bedroom Reveal, but I was so grateful for some friends helping do the drywall and mudding and taping while I ran my kids places! There was a lot to do! They were amazing! We used something similar to This for the light box, and eventually we were able to screw it to the studs. Phew! 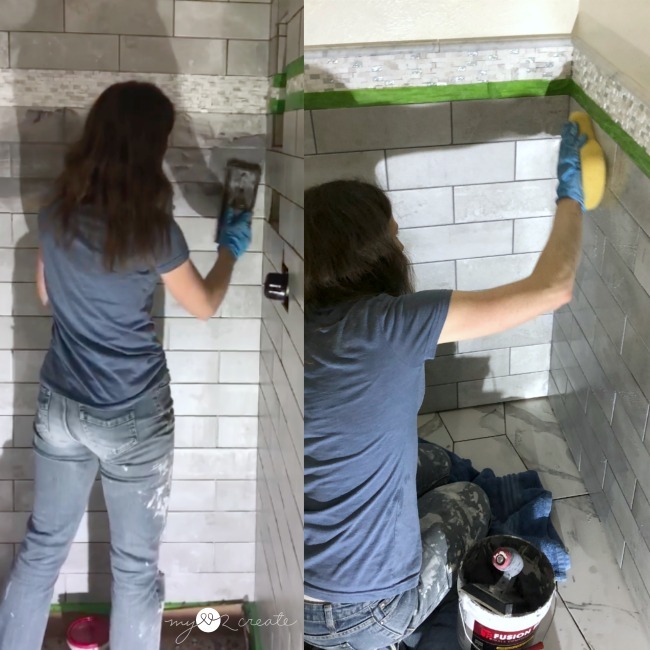 While the first coat of mud on the walls dried my friend and I did some grouting! Finally!!! It look us a little bit to get the hang of it, but once we did things went pretty well. 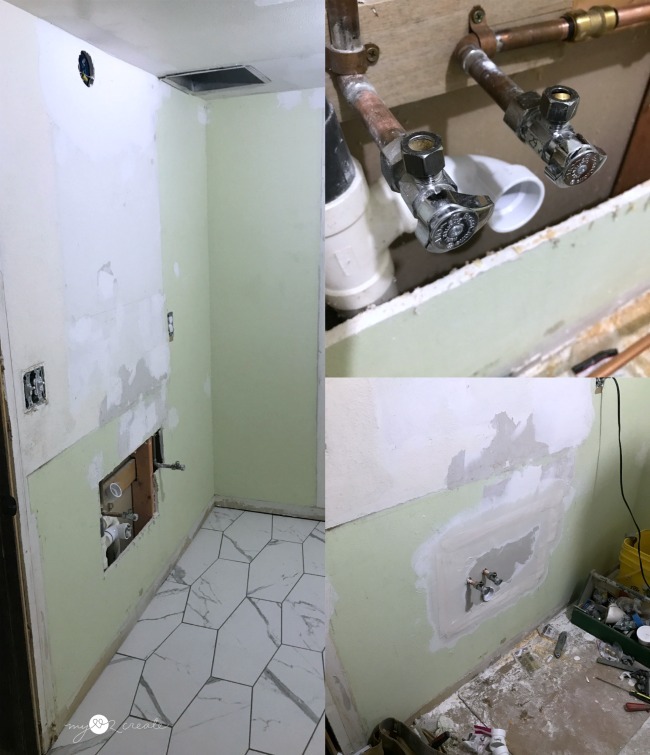 We started with the shower and then the tile around the toilet. 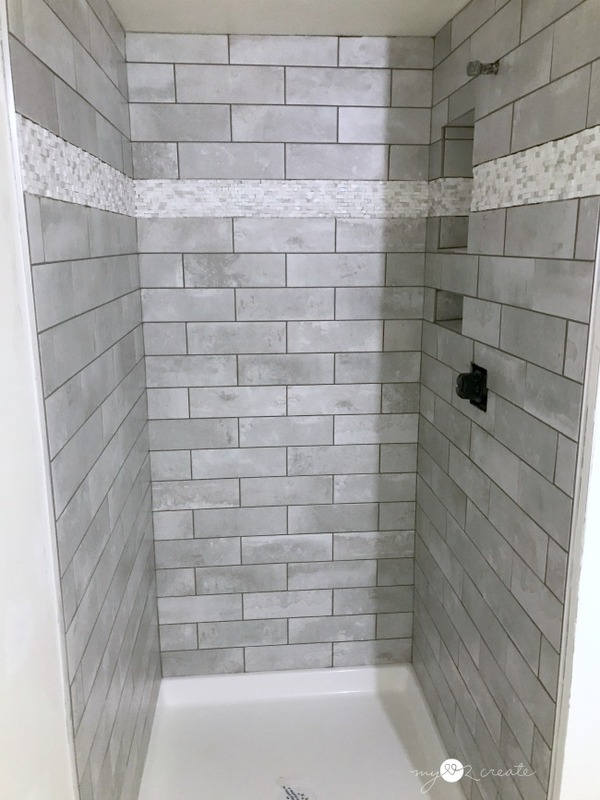 I choose to use Fusion Pro Single Component Grout , because it doesn't have to be sealed!!! Best choice EVER. 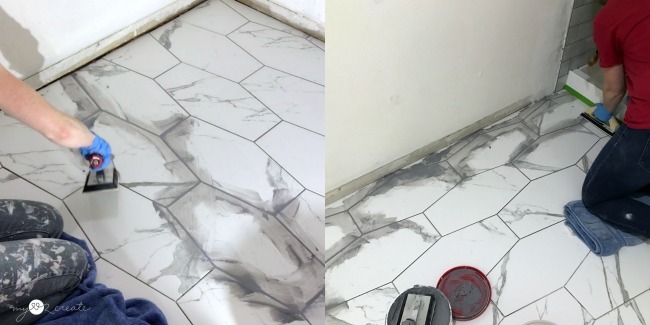 It saved me time and was only a small amount more money than using regular grout and sealer. After grouting the walls we moved to the floor. Can you believe it took so long? I finished the floor 2 weeks ago! 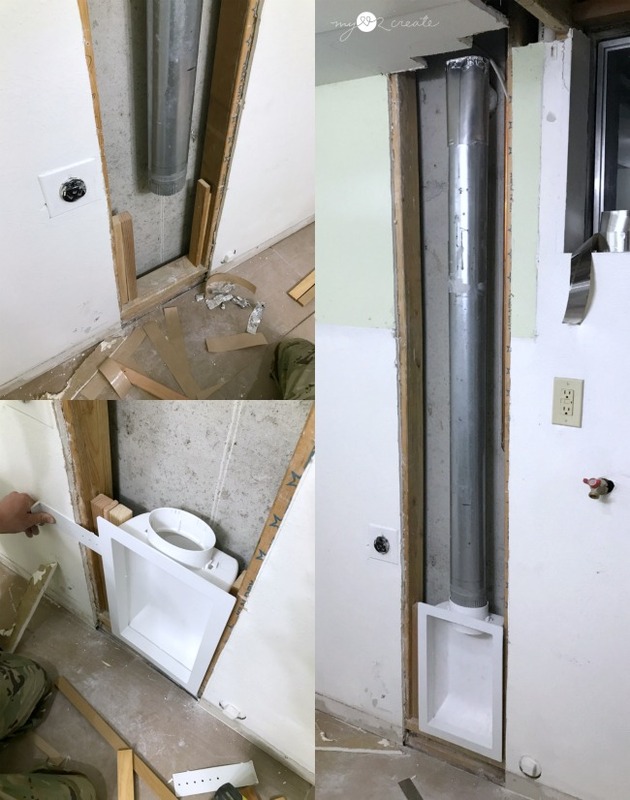 The plumbing for the vanity was moved over by the same friend that helped with the shower. He patched it and it got the first coat of mud. And of course while we just started closing walls up, we decided to open up another one. The washer valves and pipe were worked on, and still look this way today, so yeah...can you see why I need a miracle? SO MUCH TO DO IN A WEEK!! Here is a shot before the washer wall got opened up. 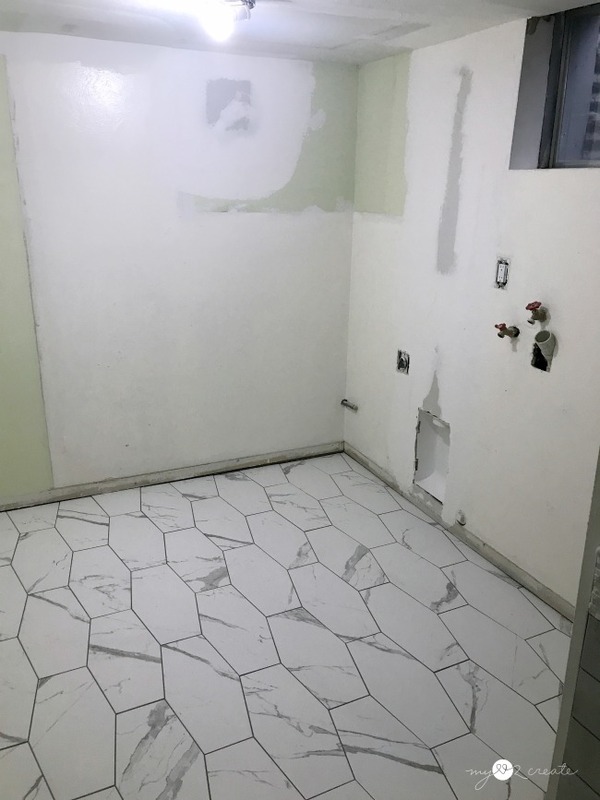 Look at that grouted floor!! Yippee!! Texture needs to happen on the patches, but it is so nice to have a ceiling filled in! 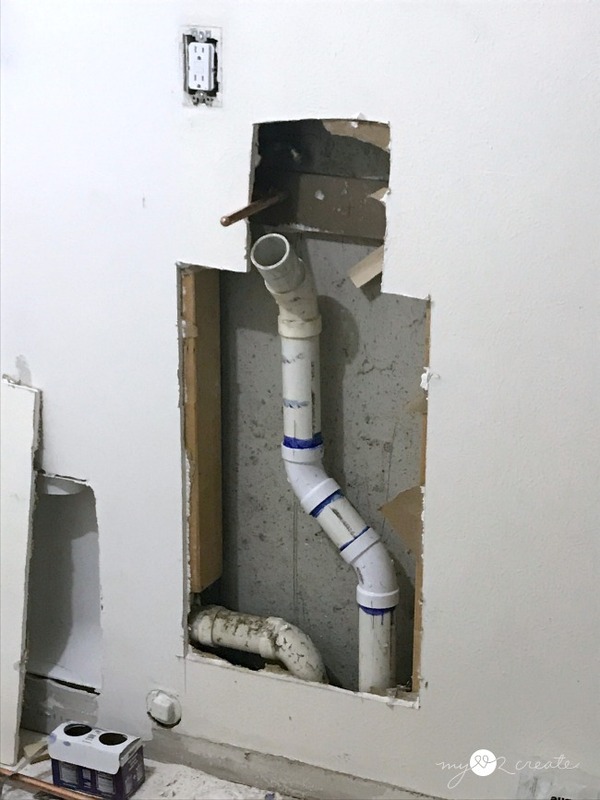 That open part is for the HVAC vent. 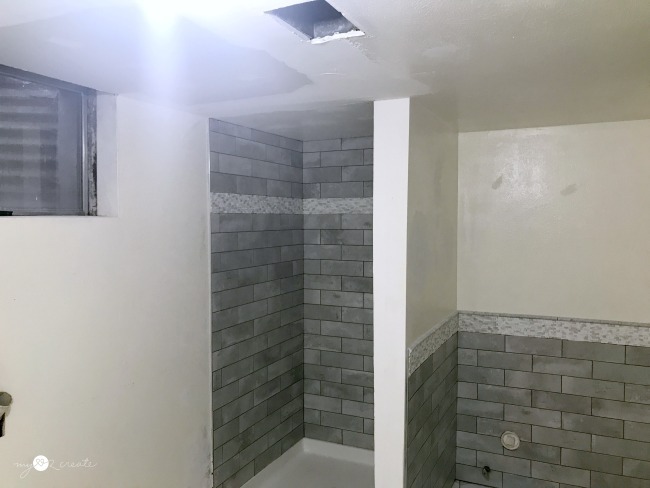 Not to mention the rest of the shower needing to be put back together. And a toilet? Who needs a toilet!?! So there you have it. One week and I have a mountain of work to do! I think I want to cry, but I am determined to finish strong!! Wish me luck!! Don't forget to check out the rest of the participants in the One Room Challenge Week 5! See you next week for the final reveal (I hope!! ), thanks for tuning in! Wow! Nothing but respect for all your hard and time consuming work! 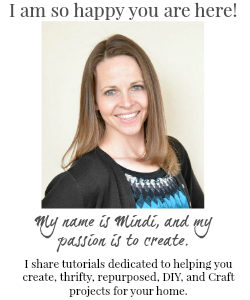 Mindi, you are amazing and the new floor and shower tile are gorgeous! 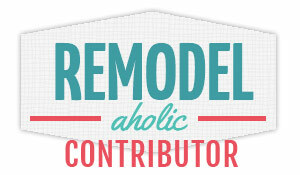 Geesh, I can only imagine how many hours you have spent renovating this space.